Based on new documents obtained under Freedom of Information Act, and on our meeting with the Department of Education last month, Atheist Ireland is optimistic that the Minister for Education will soon issue a Circular Letter about the timetabling of religion in ETB schools, that we requested the Minister to issue in 2016. We now know that Education and Training Boards Ireland, the collective representative body for ETB schools, has been reviewing its position on religious education since 2016, and that it has been doing this in response to correspondence from Atheist Ireland. and Constitutional Rights. You can read our full report here. Among other recommendations, we asked the Minister for Education to issue a Circular Letter informing schools at second-level that: (a) the State Religious Education Course is not compulsory and students can choose another subject, and (b) schools should actively inform students and parents about this. In July 2016, Emma O’Kelly, RTE’s education correspondent, reported on our request to the Minister to issue instructions to schools to ensure that Religious Education is timetabled in such a way as to give students real choice. You can read the RTE report here. In August 2016, Atheist Ireland wrote about this problem to all sixteen ETBs, including the CEO and all the County Councillors on the various Boards, outlining their legal and constitutional obligations to facilitate opt-outs. You can read that letter here. The start of the ETB review was revealed in minutes of a meeting of the Principals Network of Kildare and Wicklow ETB in September 2016, recently obtained by Atheist Ireland under the Freedom of Information Act. You can read the extract from those minutes here. This timing is consistent with emails between ETBI and the Department of Education in 2017, which we also got under the Freedom of Information Act, in response to communications with a parent who is a member of Atheist Ireland. In these emails the Chief Executive of ETBI said that the current situation on religion was most difficult to defend. You can read these emails here. It is also consistent with discussions that Atheist Ireland had last December with the Department of Education, about the development of the proposed new circular letter from the Minister for Education about religion in ETB schools and colleges. We met with the Department along with our secular colleagues in the Evangelical Alliance of Ireland and the Ahmadiyya Muslim Community of Ireland. Based on that meeting, we are optimistic that the Circular Letter that we requested in 2016 will soon be issued, and that it will be based upon the Department understanding the constitutional and human rights obligations that we outlined then. 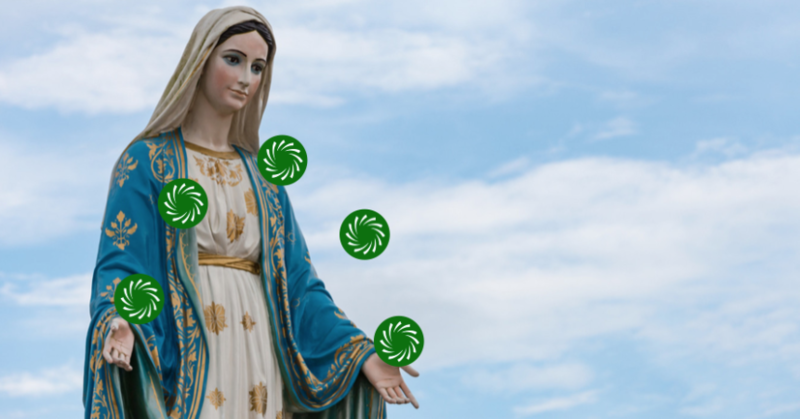 Atheist Ireland would like to again thank everybody who has donated to our Freedom of Information Request fund, which we have used to obtain a lot of useful information about the influence of religion on State-managed ETB schools. The meeting of the Principals Network of Kildare and Wicklow ETB was told that ETBI was reviewing their position on religious education in response to correspondence from Atheist Ireland. The minutes outlined that schools were not obliged to find another subject during religion, and that the general consensus at the minute was that students stay in the room. It then conceded, as Atheist Ireland has consistently highlighted, that the Education Act allows students to opt out of any subject. They then conceded, as Atheist Ireland has consistently highlighted, that the Education Act allows students to opt out of any subject. 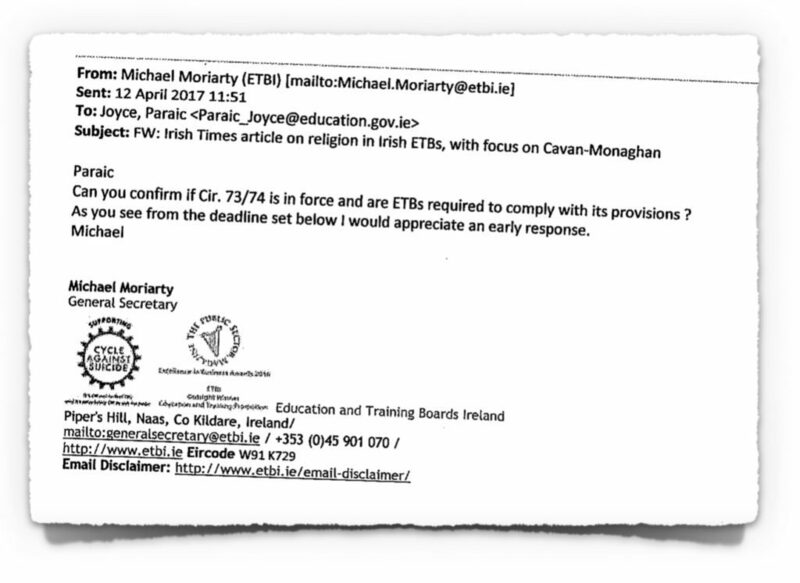 This is consistent with emails between ETBI and the Department of Education in 2017, in which the Chief Executive of ETBI told the Department that the position on religious education was most difficult to defend. These emails were as a result of Peter McGuire, Irish Times journalist, writing about a member of Atheist Ireland who was having difficulties getting information about opting out of religion from his local ETB and from ETB Ireland. Atheist Ireland also got those emails under the Freedom of Information Act, but only after we appealed to the Information Commissioner an initial refusal to give us the emails as they were part of policy discussions. This is encouraging, but so slow. Even now, the Minister persists in sending out a ‘circular’ with instructions; if he’s making a regulation, he must publish such as a Statutory Instrument to the Dail and Seanad where they are free to accept, discuss or reject it. He has no business subverting the obligation on the Dail to legislate and his obligations under the SI Act. Constitutionally, the right to opt out must not be to the disadvantage of (= prejudicial to) the opting-out student; the student must be given teaching for the same duration in some other subject. In Germany, such students (at second level , ie over 11 years of age) must study Philosophy.